stereotype that can be seen in films, memes, satirical YouTube videos and regular conversations among friends – that is the life of a typical engineer. It is common knowledge that engineering is one of the most sought after degree courses in the country and it is a profession that society at large favours as a good choice of profession as there is that perceived sense of security and potential ‘bright future’ that comes with the job. What’s also common is to hear about how engineering students want to pursue different interests and jobs after they graduate. While such decisions are often met with scepticism and lots of discouragement, there are those who follow their passion, come what may, and end up creating successful and inspiring life stories for fellow dreamers. The book talks about the journeys of these twelve, who are in their 20s and have created stories towards success. Addressing these stereotypes about engineers, Priya believes that the wisdom and knowledge a person gains during their studies helps them later on, giving them an edge in their respective fields. “Thus, the degree one is currently pursuing won’t go waste if they decide to pursue their passion later. There are plenty of things that we learn during our education tenure that certainly help us, not just in our careers but life on the whole. “Education and passion should go hand in hand. When one is taking up his or her degree, whether engineering or something else, one should try to explore other fields and identify what suits them. For instance, today, all creative fields are linked with technology, so any technical degree one pursues will help them in their career, regardless of what their area of interest is,” says Priya. Priya herself has an interesting journey of self-discovery, where she nurtured her passion for writing since her schooling days at Jawahar Navodaya Vidhyalaya (Valpoi), right through college and getting a job with a software company in Pune, where she took up blogging, focusing on her travel, adventures and experiences. Buoyed by the strong response she got for her blogs, she decided to try a biography blog. That’s when she met a computer engineer turned musician and happened to interview him. This, along with her own thoughts on the subject, led to her conceptualising the theme for the book. The book also highlights celebrities like international DJ and producer Anish Sood and Indian women cricket team player Shikha Pandey, recipients of national awards like filmmaker Aditya Jambhale and youth leader Raghuvir Mahale Purhohit, as well as other engineers who are now leading figures in their fields like Chaitanya Malik (agriculture/farming), Jyoti Pandey (fashion designing) Sameetha Dessai (events/ digital marketing), Anuj Prabhu (actor), Radhika Redkar (paper craft artist/ gallery owner), Akshay Parvatkar (film screenplay writer), Ashwini Krishna (social enterprise) and Anup Muraraka (musician). “With the help of the 12 stories of young engineers featured in the book, I have touched upon various challenges a young passion seeker is likely to confront, and also attempted to provide practical solutions. Some of them are: How do I convince my parents? What if I fail? Will I make enough money? What will society say?,” adds Priya. Besides the stories and challenges on these entrepreneurs, every chapter has a dedicated section that attempts to provide practical solutions on how to convince parents to take up a career of choice, various definitions of a dream, message to the passion seekers, relationship between education and passion and some interesting facts about engineering. “Today, the craze of following one’s passion is trending so much that the young kids are abiding by it without even understanding the crux of it. Being passionate is good, but that’s just not enough to chase your passion. It’s extremely important to endure the pain that may come you way. To excel in your sphere of interest takes hard work, dedication and the spirit to keep going despite of the hurdles. Sometimes, passion seekers fail to understand this and end up in a mess, maybe by leaving college or their jobs without proper planning, etc, and then they are tagged as ‘frustrated engineers’. The book attempts to touch base upon facts like this,” adds Priya, when asked to advise youngsters. 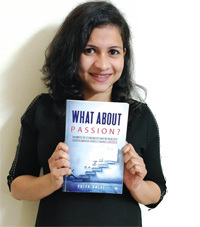 With online comments like “It is what I have been looking for” and “It is a mandatory read for all young passion seekers out there”, Priya has certainly struck a chord with the youth.